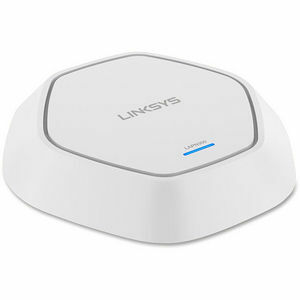 Single-band access point features Wi-Fi technology (802.11n) to provide a fast, powerful wireless network at a transfer rate of up to 300 Mbps. With a Gigabit Ethernet port, wireless clients can enjoy the fastest speeds possible by maximizing wireless-to-wired performance. High-power wireless coverage offers a wider reach to strengthen your network connection. Plus, the flexible design can be deployed as a typical access point, as a wireless distribution system (WDS) or as a workgroup bridge to extend your wireless range coverage. Access point is integrated with 802.3af power over Ethernet (PoE) capability to eliminate external adapters and facilitate optimal placement. Protect and secure your wireless network with business-class security features including Rogue AP detection, SSID to VLAN mapping, and 802.1X Supplicant.